Dual-sided for the toughest jobs, when you really need to cut through the dirt. • Inks and permanent marker ... and so much more. 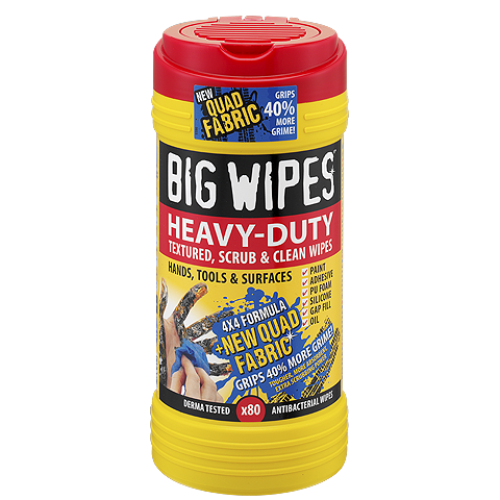 A ground‐breaking new formula and upgraded fabrics, Big Wipes has also developed an innovative packaging solution. Still in the famous Big Wipes Yellow, we have designed an all new wipes cylinder that is unique to Big Wipes. This novel large capacity tub is styled with an easy grip body and base and brand new quick seal lid. This clever ‘flick and a click’ lid gives users a dual option of either dispensing a single wipe (by pulling the wipe towards the cap) or a long continuous sheet of wipes (by pulling the sheets away from the cap). 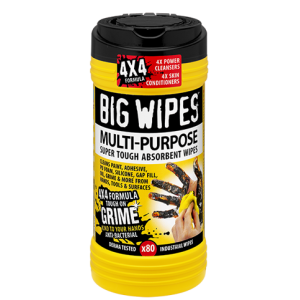 Big Wipes Multi - Purpose Wipes 80 Pack / Tub SUPER TOUGH ABSORBENT WIPES Cleans up th..